As successful filmmaking partnerships go, Luc and Jean-Pierre Dardenne have a special place in the hearts of film fans everywhere and have won a slew of awards, including the Palme D'Or twice at Cannes (they were nominated twice more). Now Artificial Eye are to release a box set containing six of their features, including all for Palme D'Or winners and nominees. Winner of three awards at Cannes (the Palme D'Or, Best Actress – Émilie Dequenne – and the Ecumenical Jury Special Mention) this tough, uncompromising portrait of a troubled adolescent is at once shocking, uplifting, harrowing and life-affirming. A true classic of social realist cinema. A taut, tense, riveting drama about pride, secrets and the struggle to communicate, this electrifying character study features a stunning, award-winning performance by Olivier Gourmet (Best Actor – Cannes 2002). The Dardennes' second film to win the Palme d'Or (2005), this devastatingly powerful story of life on the edge of society is one of the most emotionally complex and deeply humane works ever committed to film. An intricate, engrossing portrayal of an Albanian immigrant and the web of deceit, complicity and guilt that she finds herself embroiled in, The Silence of Lorna was rightly awarded Best Screenplay in Cannes 2008. Winner of the Grand Jury Prize at Cannes 2011, this touching, intimate and astoundingly naturalistic depiction of a young boy's struggle to reconnect with his estranged father has confirmed the Dardennes' place at the forefront of world cinema. 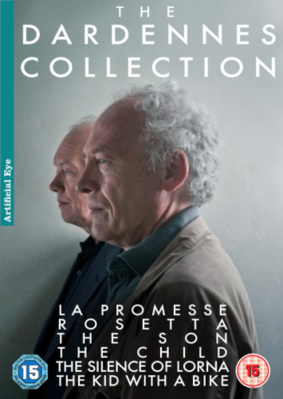 The Dardennes Collection will be released in the UK as a DVD box set on 10th December 2012 by Artificial Eye at the RRP of £59.99. No extra features have been listed, but I wouldn't rule them out.